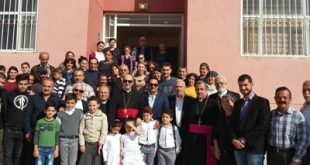 St. George Parish of Damascus has established a cultural committee which is comprised of doctors, engineers, teachers and lecturers among other professionals. The aim of the committee is to educate through talks and lectures for the faithful, with each professional presenting on their own field. The committee commenced its first program on 17 January, during which Dr. Dn Sargon Youil spoke to the children of the parish about dentistry and ways of keeping their teeth clean and healthy. The talk was attended by Reverend Toma Asitivo, parish priest, along with deacons, committee members, the ACERO board of directors and many parishioners. His Grace Mar Aprim Nathniel bestowed his blessings in establishing the committee, along with Rev. Toma. Isho Benjamin has been placed as the official representative of the committee.